From the Hancock County Courthouse, go east 2 blocks (0.2 mile) to Boland Street. Turn right on Boland Street (which eventually becomes Linton Rd) and go 9.2 miles (which is about 0.4 mile past the Beulah Hwy - Linton Rd split). Turn left on Ridge Rd. Travel 1.5 miles to a log road. Turn right on the log road. The cemetery is 500 feet or 0.1 mile from Ridge Rd. and on the left side of the logging road. The lot around George Washington Ausborne / Osborne's grave is surrounded by stone coping, which is large enough to hold as many as 8 graves in addition to Osborne's. Dates per family records. No date appears on gravestone. Marker is spelled "Ausborne", but the family believes it should be spelled "Osborne". Co. I, 59 Regt. Ga. Inf. 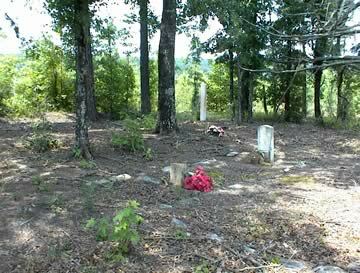 At one time, more graves were visible in this cemetery. George Washington Osborne's black cat is buried under some rocks near its owner.